HVAC companies need a partner who can provide an extensive range and innovative solutions for tightness tests, vacuum and filling. For decades, Fives has developed specialized expertise in pressure, vacuum, tightness tests, evacuation and filling, as well as leak testing processes such as snifing. Fives' global solutions are based on a throughout understanding of HVAC customers' needs and in-depth analysis of their products. 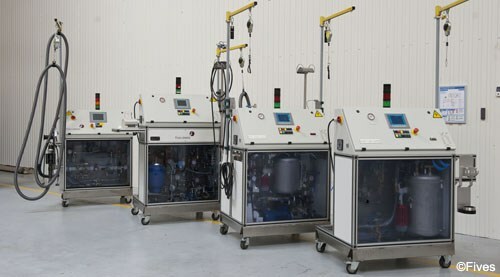 From stand-alone production units to turnkey systems connected to plant networks, Fives' equipment meet the expectations of the most demanding customers. RapidCharge® technology covers a wide range of refrigerants, such as 1234yf (HFO), R134a, R744 (CO2), AC6, R404a, R410, R407, R600a and flammable gasses including alkane derivatives like Butane and Isopropane. For specific products like truck air conditioning units or compressors, RapidCharge® offers to the HVAC industry a multifluid filling process solution: refrigerant gas combined with oil, fuel, coolant, etc. Highly accurate filling equipment will provide the ultimate performance for HVAC products. The highest performance on vacuum tests (below 0.1 mbar) and production rates of up to 120 jph are offered by RapidCharge® filling equipment. Extremely demanding accuracy targets are reached thanks to Fives' global engineering policy, from fluid treatment to measurement process. HVAC products have a direct impact on energy consumption and therefore on the environment. One of the constant challenges facing HVAC experts is to work with respect to the environment. Thanks to Fives' environmental policy, Filling | Sealing expert teams have developped solutions including very limited refrigerant rejections during the filling process and RapidCharge® offers solutions to reduce emissions.